Lorne Coe of the Progressive Conservatives, Niki Lundquist of the NDP and Elizabeth Roy of the Liberals will find out who will be the next MPP for Whitby-Oshawa following the Feb. 11 byelection vote. For the fifth time in less than two years, residents in the Whitby-Oshawa area will be headed to the polls. In a series of elections that has streamed back to the provincial runoff early in the summer of 2014, the 150,000 or so residents of the area are no strangers to the democratic process. Voters will be deciding who will be replacing former MPP Christine Elliott, who stepped down from the post in August following an unsuccessful bid to become leader of the Progressive Conservatives. Since stepping down, Elliott has been named as the province’s first patient ombudsman, officially starting in her new position this summer. 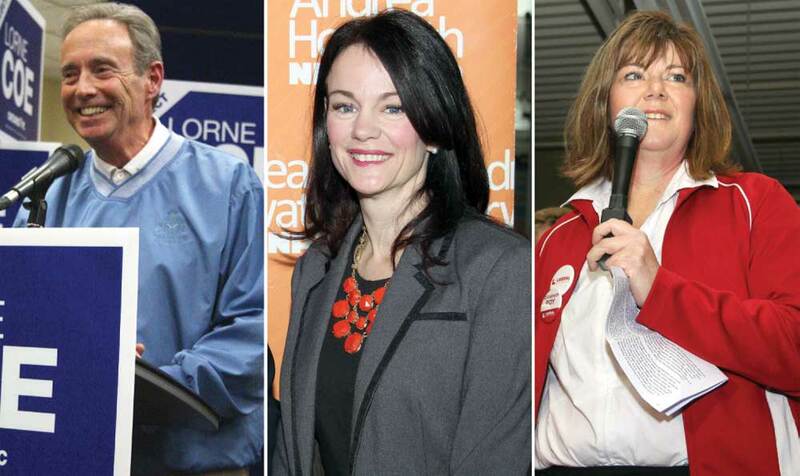 With those residents heading back to the polls on Feb. 11, The Oshawa Express sat down with the top three candidates ahead of voting day to see what they would bring to the table at Queen’s Park. Lorne Coe first entered politics more than a decade ago, and has been sitting as a councillor in Whitby ever since. Now, 13 years later, Coe is looking to make the jump to provincial politics under the blue banner of the Progressive Conservatives. Coe says that when he first got into politics, it was for much the same reason he is hoping to make the transition to the benches at Queen’s Park: to better his community. “I first ran in 2003 because I wanted to make a difference in my community – in the town of Whitby – but particularly address some key issues related to planning and development and supports for seniors and youth…which I, at that time, didn’t see being addressed,” Coe tells The Oshawa Express. Coe is no stranger to the provincial legislature, having previously worked as a senior civil servant in various ministries prior to getting into municipal and regional politics, including the Ministry of Health and Long-Term Care and the Ministry of Finance. Elliott, who endorsed Coe’s nomination and campaign, has loomed large for many voters in this election, and the grandfather of two has said he will push to continue the work that Elliott and her late husband, Jim Flaherty, started in the area. “I said from the very beginning that it’s my intent to continue the legacy, particularly of Christine Elliott, and how she in particular served the constituents over a very strong career as a representative, and similarly the late Jim Flaherty,” Coe says. In past interviews with The Oshawa Express, Coe has expressed his concern with high hydro rates, the selling off of the majority of Hydro One and what he sees as worsening conditions for the people in the community. After several weeks of knocking on doors and answering phone calls, seeking more people to direct their vote his way, Coe says this sentiment remains the same. “For me, the concerns of Whitby-Oshawa will always come first. That’s always been the case as a regional councillor as well,” he says. Of the three main candidates, Niki Lundquist is the political rookie. She’s never held political office before, much less run a political campaign. But after seeing how the province has been run, she says she felt she had no other choice but to get into the ring. “When you are somebody who is kind of passionate, I think what tends to happen is something galvanizes you, and for me I sat back and was concerned about healthcare generally, particularly concerned about seniors. And I’m not saying that because it’s a popular issue, I’m saying it because I’m going to be in that place soon where I can see my parents are getting older and there are fewer and fewer services available,” Lundquist tells The Oshawa Express. Lundquist says there is no doubt as to what the biggest complaint she’s hearing after weeks of canvassing. “It’s hydro. Every house, it’s hydro. There’s other issues too, but the sale of Hydro One has been galvanizing people because they realize that it’s a terrible decision. They absolutely get that it gets us nothing,” she says. Lundquist adds that other issues she’s been hearing more about include a lack of affordable housing, poverty, healthcare, education and jobs. “There are so many people that have been out of work for a year or more, and they’re talking about moving because they can’t find anything that is something they can support their families with,” she says. When asked about the latest poll numbers, Lundquist says they’re only numbers and aren’t indicative of what she’s seen throughout the campaign. “I’m not worried about those numbers. That poll doesn’t reflect the reality, at all, of the conversations we’re having at people’s doors. It doesn’t reflect our own polling, frankly,” she says. Of the three major candidates, Roy is the veteran of provincial elections, with the Feb. 11 showdown marking her second time on the ballot. This time around, Roy will be attempting to do something that hasn’t been seen in years: making Whitby-Oshawa vote Liberal, and not Progressive Conservative. However, Roy says she doesn’t see it like that – rather, she says the riding was voting for Jim Flaherty and Christine Elliot, not the party. “The argument that’s being presented to me at the door is that this is a Christine (Elliott) riding at the provincial level. We have been at many doors who when I ask the question, ‘Have you voted Liberal in the past?’ many have voted Liberal in the past federal election, but the question being asked further is that, ‘No, I didn’t vote (Progressive) Conservative, I voted Christine Elliott,’” Roy tells The Oshawa Express. Both Coe and Lundquist have cited the sell off of Hydro One and potentially higher electricity costs as a result as a reason not to vote Liberal in the byelection. Roy, however, says that people have been misinformed about the situation. Roy adds that while 60 per cent of Hydro One will be sold, no one entity can control more than 10 per cent, meaning the province will still have control over the utility, and that the province will still receive the cost of the shares themselves, as well as dividends from the sale, resulting in billions of dollars being raised for infrastructure spending.